Our 1950 Chevy: ready to roll. Some imprints last forever. Your first bank account. Your first cola. My parents’ car was a strong imprint for me. We had GM cars since the dawn of life it seemed. So my compass was frozen on GM: Chevy, Buick, Oldsmobile, even the Vega! 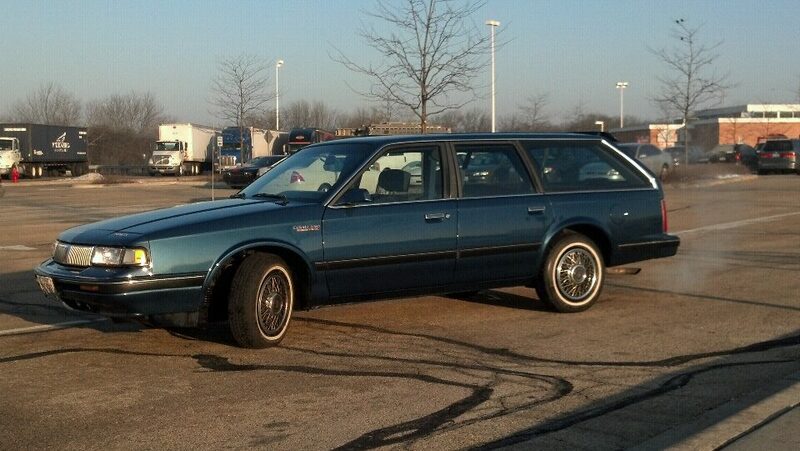 The 1986 Olds Cutlass Cruiser Wagon. 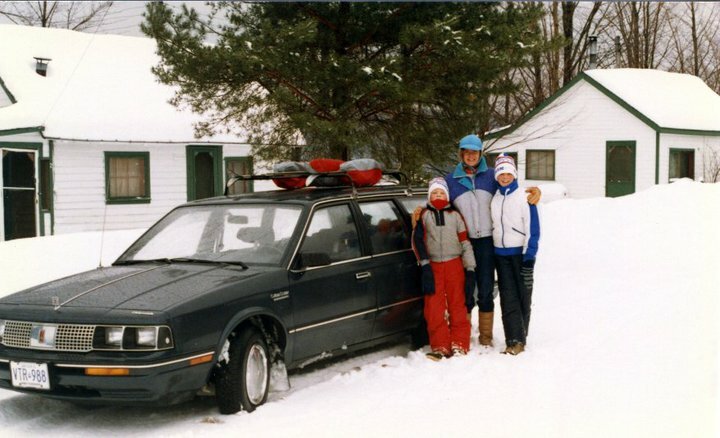 Our first big car in my family of four was an Olds Ciera wagon: the Cutlass Cruiser. We bought it 1986, and loved it so much, we bought another, just like it, in 1990. Within the day, I drove a new Cutlass Cruiser off the lot. Pretty much the same color, had the same cool rear-facing third bench seat the kids loved. The only upgrades: Electronic Fuel Injection had replaced the carburetor, and air conditioning and FM radio. People still ask if there’s a rear-facing seat today. I kept the hand crank windows just in case we drove off a bridge into water and couldn’t get the doors opened. 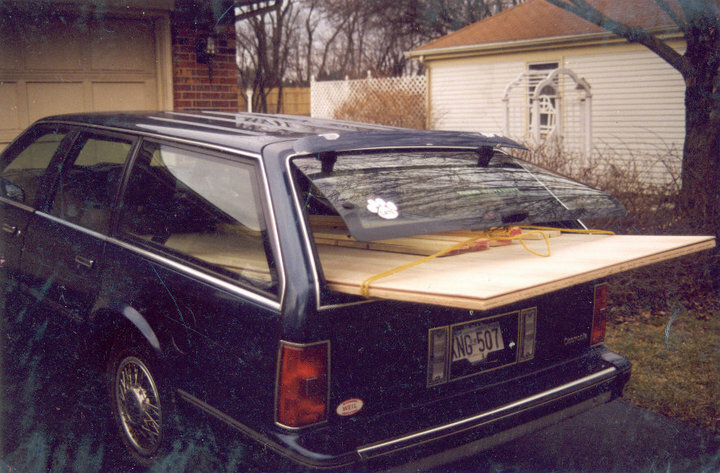 When people asked why I liked the Cruiser so much, I had a bunch of responses, but always described how I could get a 4×8′ sheet of plywood in the back window without opening the rear door. The guy looked at me like I had just wandered in from the woods. I was stunned. I had been in the woods, asleep for at least 7 years during which time “station wagons” had been driven (haha) to extinction by GM. I walked out in a daze. One of GM’s innovations: the hatch window. Knowing I couldn’t let the Cruiser go, I chose instead to get it painted. I could live with it if at least it looked new. 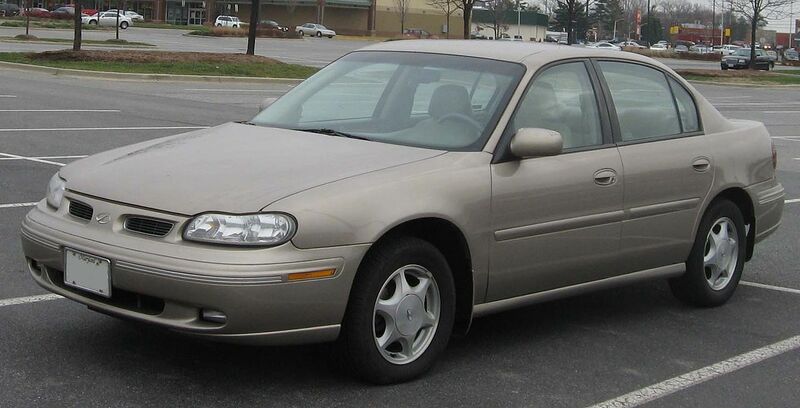 The last Cutlass in 1999. A low-fat ghost of prior greatness. In 2007, I wrote GM a note about my car, filling in the owner’s survey. I was 17 years late. Alas, unbeknownst to GM, the last Cutlass had rolled off the line in 1999. 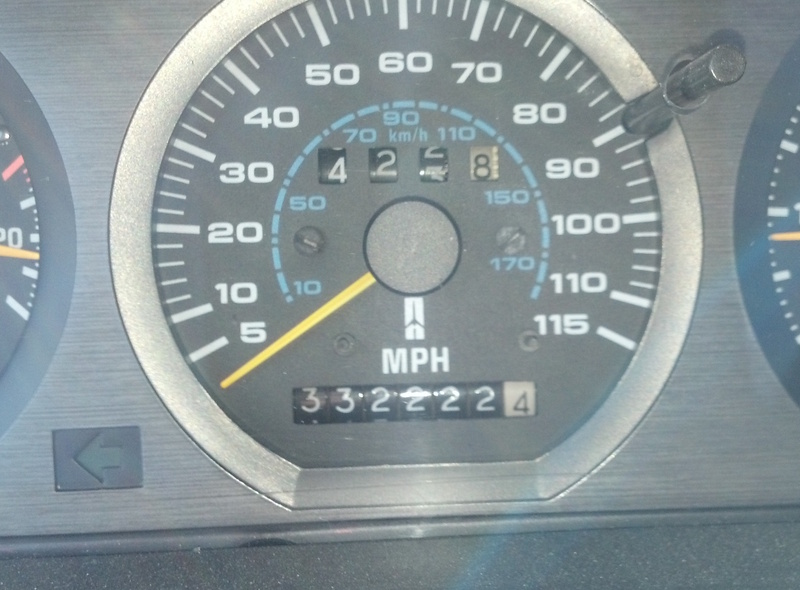 Fast forward, the Cruiser became my commute car, and I tacked on the miles. Incredibly, it never ground to a halt. With the occasional makeover on wheels, alternators, batteries, brakes, suspension and mufflers, the Olds just kept on rolling. How? By regular, faithful tune-ups. Jiffy Lube gives me and my Olds a pat on the back. Every 3,000 miles I drove in to JiffyLube and let them soothe the Olds’ jangled commuted nerves. That’s where they knew my name, too. Pretty cool! Lo and behold, in March 2011, I notched 300,000 miles. 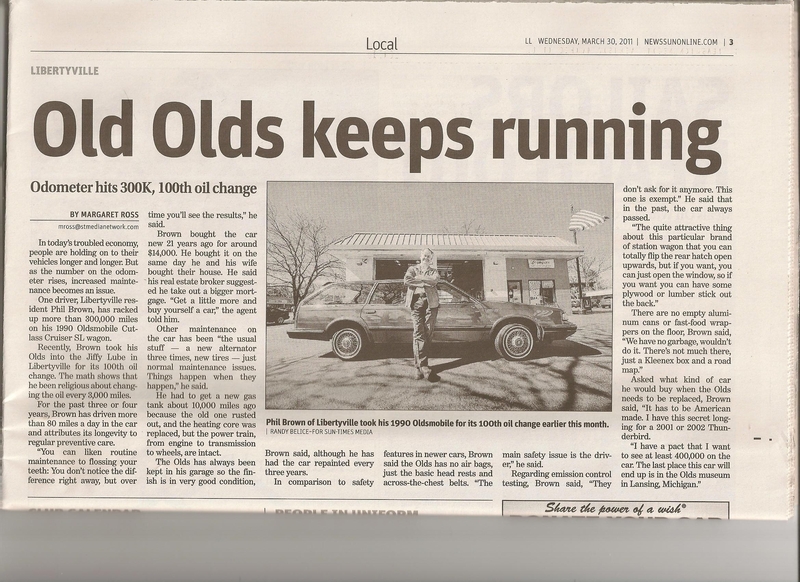 Jiffy Lube (Shell Corp) blessed me with a year’s free oil changes, and a PR push that got me radio interviews and some pub in the local news. A 2014 testimonial to a brand that won’t quit. Is there a lesson here? Several. First off, stick with the one who brought you to the dance. 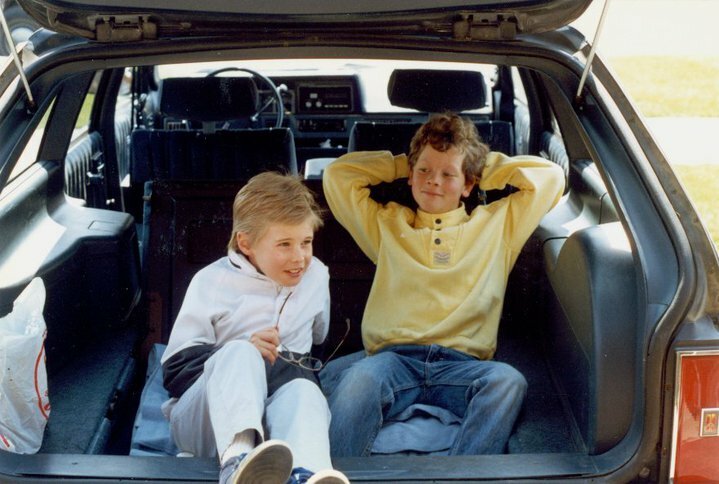 I still drive my Olds wagon. And I hold a torch for General Motors. Who knows, the Cutlass may return. Second, seek out faithful, loyal customers and celebrate them. I always take my cars to Jiffy Lube. Third, never smirk at a potential sales inquiry. I have never purchased another car from the dealer who said, “no” in so few words. That is the view from the rear-facing seat. Great pictures Phil, happy Thanksgiving. Thanks Bob! 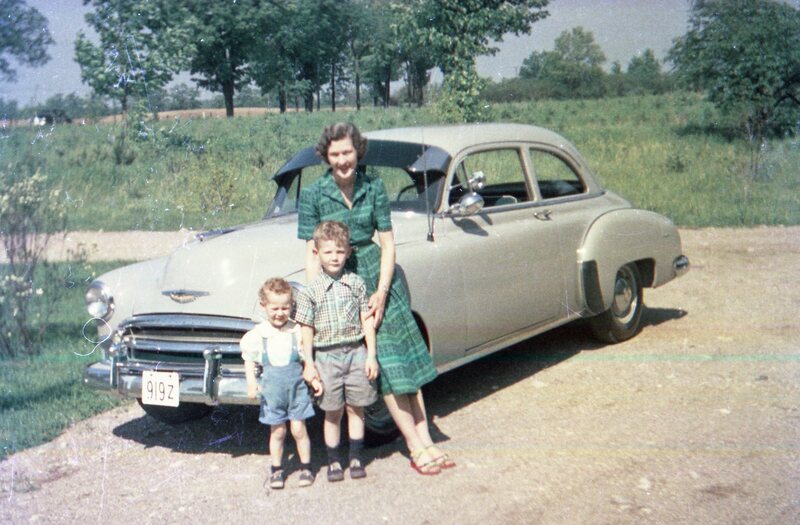 The GM line was a rock in the foundation of our family life. Very easy to relate back then, but hard to replicate today. I hope the Cutlass, the Transam, and the Firebird will all return one day, reminiscent of their great 70s style. Hey Phil, my 1998 Buick LeSabre with 215,000 miles hardly compares with your 300M+ Cutlass…but we do have a lot in common. My father was also a GM lifer except for one year when I was 17 and convinced him to buy one of those big Chryslers with the “wings”. He was lost in it and dumped it 8 months later at the same time he finished paying off the loan. Back to Chevy from there on out. LeSabre is also out of production now about 5 or 6 years, sorry I didn’t upgrade at the time but my Forest Green beauty is holding up very well. I’m looking to get 300,000M on it but given my miles per year has dropped to about 5M from 15M the numbers look tough unless I give the car to one of my son in laws which I tried to do about 10 years ago and he laughed “I can’t drive a Buick”. Does not look good! Regards, Allan. Allan let me remind you that Blue drove you back to Ohare from Galena il one time! We actually got a new Buick LaCrosse, and love the car. Better than the Cadillac it replaced. The new Buick ads are effective in bringing the message that the Buick of your father is gone. I am particularly content that the tone deaf GM designers of the 90s are also gone. If they weren’t the architects for Cash For Clunkers, they were certainly the cause. Thanks for writing! This is one of my favorites ! Happy Thanksgiving to you and Jane and hope to see you soon. Thanks Dan! We look forward to seeing you too. We are envious of what will be a “grand” Thanksgiving day for you and Barb. Enjoy it all. Great walk down memory lane Phil. 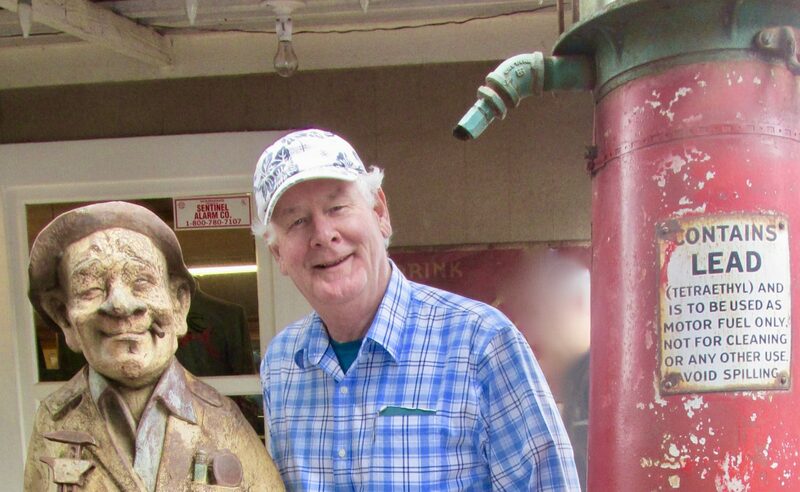 Had my dad known yours there would have been a lot of spirited albeit friendly banter because my dad was a ford man through and through. Even had a Monarch in the early 60’s. Really enjoyed the read. Thanks Phil. Hi Don! Glad you enjoyed it! This has been a very stimulating post; I have received a lot of emails. When I was a kid, the GM dealership in our small town was the sole sponsor of the Delhi Rocket 88s Hockey Team. Talk about branding! We drive a new Buick LaCrosse today. Quite a nice car! I am still waiting for the rebirth of the station wagon, though. Mercedes Benz has one. Mean time, GM should get back to disinterring the Olds Cutlass… and the F86. All the best, and thanks for writing!